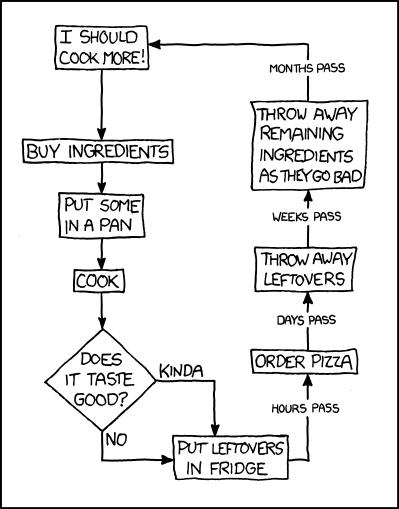 Ironic that this XKCD.Com comic came about cooking. At any rate, I have a cake recipe. Yes, from scratch. I can predict a few things about this particular recipe. First, it will go wrong somehow. I always forget something, and always recover. One year I had the Butter creaming in the mixer and found out that I was short on flour. This year it was that the chocolate squares were over warmed in the microwave and crystalized around the edges. No big deal, it wasn't so bad that anyone noticed right? Another is that it runs a little dry. Not markedly so. Just with this terrible oven I have, it isn't as moist as commercial cakes are. I could add a little more fat (butter or shortening) to it, but that would change the taste. It isn't DRY, it's merely not as moist as I like it. Otherwise the recipe is a good one, predictable. I can always get a very nice flavor out of it following it literally and a cake I can serve to others. The results are in the refrigerator. This time I got a very tall, three layer chocolate cake out of this. Whenever I bake I purposely cream my butter much longer than suggested. It gives me a lighter batter. I'm certain there are places where all that air will result in the wrong texture... I'll let you know if I find it. I also creamed the batter itself. I think by the time I had all the air in this it doubled in size. It is hardly necessary, more of a "ooh look what I can do" sort of thing. The texture didn't suffer, and in fact it turned out quite nice. Three layers of chocolate goodness. If you never have made a chocolate cake from scratch it can be tricky but not something to run screaming from. Melt your chocolate in the microwave at low to medium power. If not then do it at full at a very short blast, maybe 10 seconds at a shot. I turned around and got cocky and thought "Hmmm 30 seconds will do it!". Sure, but it gave me caramelization that I did not care for. You will need a proper stand mixer to do it the way I did, but a hand mixer will work if not as easily. 2) Sift Sugar, flour, baking powder, baking soda, baking powder, and salt into the butter. Note: You will want to sift the flour into a measuring cup first and not measure then sift - sifting will make the flour expand some and that could be why my cake turns out a little dry since I usually forget this step. 3) Add 1 cup of milk and mix until the ingredients are smooth and dampened. Remember to reserve 1/3 cup roughly of the milk. 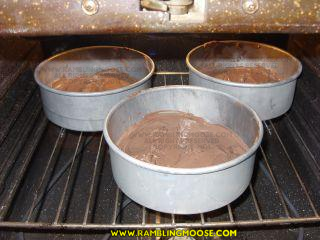 6) Pour into 3 8 inch or 2 9 inch cake pans that are greased and the bottoms are lined with Waxed Paper. Make sure that the mix is evenly distributed. 7) Bake for 30 to 35 minutes in a preheated 350F Oven. 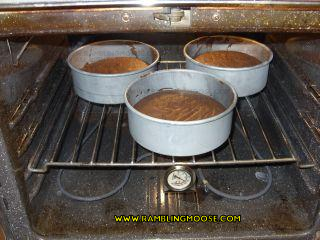 8) Turn out on racks and peel off paper after pulling them from the oven. Allow to cool thoroughly. 9) Frost with icing and enjoy.